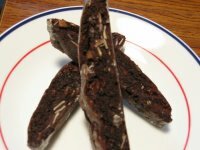 Once home, I was motivated to give biscotti a second try, after knowing how it shoud taste, and searched on all my available resources for another recipe for biscotti. I got one from "Martha Stewart's Baking Handbook", which i borrowed from the library. It's a recipe for "Chocolate-Hazelnut Biscotti". After much examination of the ingredients used in the Starbuck's biscotti and Martha's recipe, I decided to give it a try, but halving the recipe, just in case I fail again. There were some descriptions that I was cluelss, like "beating the eggs and sugar until ribbon-like trait is formed for a few seconds when the whisk is lifted". What the heck was that? I proceed nevertheless, and beat the eggs, hoping that the phenomenon described would magically appear. And you bet, it didn't happen. At the point when the mixing bowl got a little hot, and the whisk started to sound and look weird, I turned the mixer off and used hand to mix the dough.